precise follow-through, positive/flexible attitude, and high standard of values and integrity." Is your PTO, School, Club, Church or Organization trying to raise money? ​Empower Shows can help you raise thousands of dollars and provide you with a super hour of hilarious entertainment at the same time. is a perfect show for your Family Enrichment Night or fundraising program. You provide the place and promotion, The Great Jeffini provides a fantastic show! You will get smiles from families when you invite them to bring their friends to a hilarious evening of family entertainment. We provide customized marketing materials, promotional ideas, and more than 50 tested fundraising "add-ons" to help you maximize your profits. Why not call today! 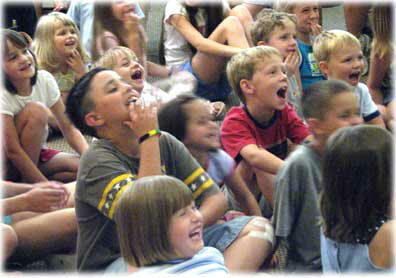 Empower Shows offers School Assembly programs and fun and fundraising magic shows in Georgia, South Carolina, North Carolina, Alabama, and east Tennessee. We are based out of Atlanta!! Call us today at 770-375-6486.